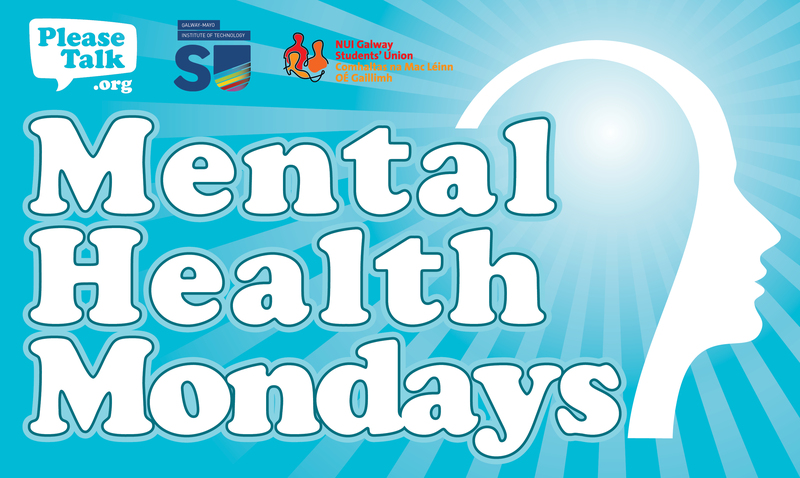 NUI Galway Students’ Union (NUIG SU) and GMIT Students’ Union (GMIT SU) have jointly launched a new campaign called ‘Mental Health Mondays’ in conjunction with the student – led mental health awareness movement Please Talk. The aim of the campaign is to cover a different topic every Monday that is associated with students’ mental health. Themes the campaign will cover include settling into college, substance abuse, self – esteem, gambling, mental health supports and looking after your mental health. Based on these topics, Please Talk will provide advice and links to relevant support services every Monday on their website PleaseTalk.org and through Facebook and Twitter. NUIG SU’s contribution to the campaign kicked off on 1 October. Free water and fruit will be on offer at a stand in Smokey’s Café every Monday from 1pm – 3pm to encourage people to talk openly about their mental health and end the cynicism and gloom associated with doing so. “Mental health campaigns are extremely important as there is an evident negative stigma attached to it,” says Clare Austick, Welfare and Equality Officer of NUIG SU. “It really shouldn’t be like that – everyone has mental health. If you’re feeling down, reach out and talk to someone. There are so many different support services for students to avail of,” says Austick. “This project highlights how we all have mental health and just like our bodies, some of us are in better shape than others. That’s okay,” says Emma-Louise Duffy, Welfare Officer of GMIT SU. “It’s about teaching people the self – awareness to identify that, and how to signpost the places that you can get care when you need it,” she says. The campaign was funded through a special screening of Meetings With Ivor, a documentary about Irish mental health pioneer Ivor Browne, in the Town Hall Theatre. For more information on Mental Health Mondays, visit www.pleasetalk.org or call to the Students’ Union to find out more about their mental health support services.